There is no stopping the rain and if it decides to pour on the day of your camping, it should not hinder you from having a lot of fun. This can even be an added adventure that you will make the whole trip unforgettable and something that you will keep laughing about long after it is over. So to prepare you for this kind of trip, there are things discussed here that will help you cope with camping in the rain because it can happen. It won’t be the end of your camping trip and it will make you happier. You should be observant of certain weather queues that might signal an approaching storm. If there are sudden gusts of wind, that means barometric pressure is wavering and there is a storm coming. You can ask the fishermen around if fish bite more often because that usually happens when a storm is coming. Pet owners say that their dogs move rapidly when rain is coming. Bring some newspaper and make sure it stays dry. In case it rains, newspapers will help you in a lot of ways. You can use them to start fire if the rest of the forest is wet and they can be inserted inside your wet shoes to help them dry quickly because it is absorbent to moisture. Camping in the rain isn’t too bad if you have the proper kind of gear with you. The tent that you should take with you is the one that has seams that are properly sealed. Have you rain jacket, rain pants, rain boots on so you are not kept from enjoying a day outside despite of the rain. Collect water directly from the rain and not water that is dripping from the trees. Open your water bottle and place it under the rain or a funnel made using a tarpaulin to direct rain water straight to your cooking pot. When the rain decides to pour down hard, it is a good idea to just stay inside the tent and immerse yourself in in books, magazines, puzzles, and other forms of entertainment that will distract you. A deck of cards is something you should definitely take with you. Hypothermia doesn’t only happen when you are staying in snow-covered landscapes and icy places. Getting wet in the rain can also endanger you of suffering hypothermia. If the temperature of your body drops below 95 degrees, then you are really in trouble. Indications of hypothermia are lack of judgment, slurred speech, shivering, frostbite, and pale skin. You are supposed to be brought to the hospital when this happens, but what you can only do now is replace your wet clothes with dry ones. They should cover you with sleeping bags and blankets to keep you warm. The temperature of your body should be closely monitored. When you decide to camp in the rain, choose a spot that is close to a hospital in case hypothermia happens. This should be placed on the dirt beneath your tent to give you added protection and keeps morning dew and water from wetting the floor of your tent. Tarps are not expensive so you can buy them anytime you are planning a camping trip. You can also place the tarp inside your tent if you want more barrier. Most of the time, your focus would be on the storm and have the tendency to forget other things. Make sure that even before the storm, you have safely placed your coals in an area where it will not get wet. You are going to need them later on to start fire, cook food, and keep yourself warm after the storm has passed. Even if it rains, that doesn’t mean you need to stay inside the tent and let yourself become bored. Wear something waterproof and head out for a day of hiking. Just make sure to slow down your pace so you don’t slip and slide, or take a shorter route. Think of ways on how you can keep yourself safe while hiking under the rain because it can still be a lot of fun. After you have returned from hiking, keep yourself warm by drying yourself with a towel and changing into dry clothes. Heat some water and drink coffee or cocoa. Lightning is one of the dangers of camping in the rain. Lightning has the possibility to strike before, during, and after the thunder clouds have passed. If you are on a boat, get out of the boat right away and swim to shore. Avoid the highest point if you are on land because lightning will strike there. If you think that branches will protect you, you are wrong because hiding under them will just endanger you of being hit by falling branches if lightning strikes. If you have kids with you, think in advance of topics that can calm your kids down in case a storm happens. After the storm, chances are your stuff got wet. Take them out of the bag right away and let them dry. This will keep mold, mildew, and other nasty smells from your stuff. Your shoes should be completely dry and your metal stuff might get rusty if they stay wet. 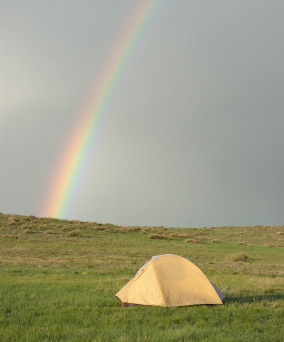 Camping in the rain does not have to be so hard and it should be something you can still enjoy. Do not let it stop you from having a camping adventure you will never forget. Just make sure to put safety first and keep in mind the things that were mentioned above so you won’t have a hard time planning everything out.